When guiding in the Old City I take tourists on the same main roads that were built in antiquity. From Damascus gate we walk along the Cardo, the main north-south route in a Roman city, traverse the Muslim and Jewish quarters until we reach Zion gate. When entering from Jaffa gate we walk along the Decumanus, the main cross street, through the Arab shuq until we reach the Cardo. From there we need to zigzag along the Via Dolorosa to continue to Lions gate on the east of the city to the Kidron valley. One day while walking along the Cardo I found the French group of artists, Cite Creation (http://www.cite-creation.com/realisations.php), painting a mural of the Cardo on a wall in the Jewish quarter. If you have trouble imagining what the Cardo was like the mural will help you see the main market street, like it was. I like their work – keep your eyes open and you will find other examples as you explore. Note the little boy with baseball cap, backpack and water bottle accepting a pomegranate, one of the 7 species of the land of Israel and the hoopoe bird flying overhead (chosen as Israel’s national bird in a vote on the Internet). 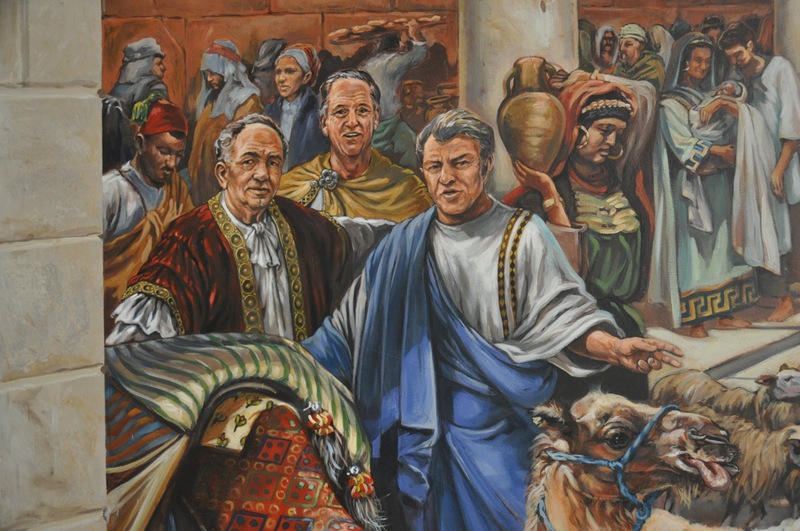 Check out the 3 gentlemen on the left side of the painting. Although they are dressed in traditional garb, there’s something about them that gives them an air of modernity. If you’re familiar with painting, often the artist includes family members or even a portrait of the artist. Not in this case – come on a tour and find out who they are and more. The Cardo was 22.5 meters wide, flanked with rows of stone columns on either side and five meter-wide covered passageways. A wooden beam construction supported the roofing, probably of ceramic tiles. The columns, five meters high, of hard limestone, were found in fragments, incorporated into later structures, the capitals are Corinthian. You will be able to walk on the original well-hewn paving stones from the Roman period. The Cardo connected the Church of the Holy Sepulcher, the holiest site to Christianityto the 6th C Nea Church of Justinian. In Byzantine times there were processions along the Cardo between these two churches. Today you can find the remains of the apse of the Nea church along the road and under the elementary school in the Jewish quarter. 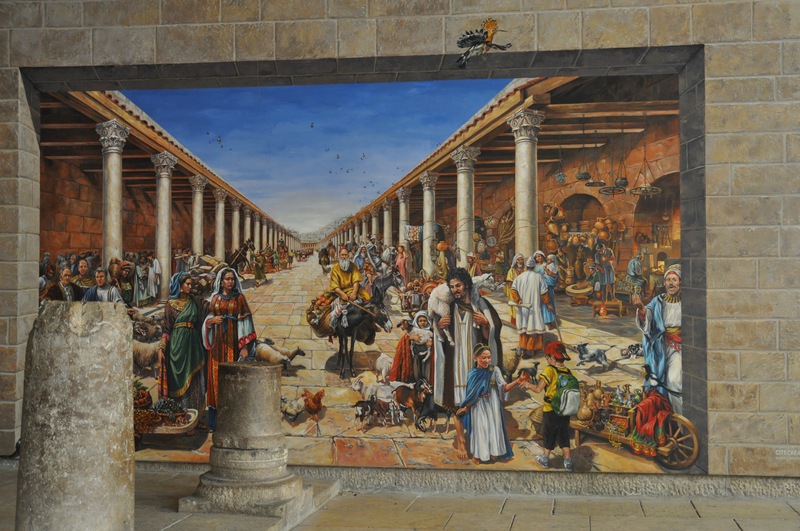 Along the sidewalk of the Cardo you can see columns (sitting on the earlier city wall from the Hasmonean period) and at the 7th Station of the Cross there is a column in the chapel. Access to the Holy Sepulcher is no longer from the Cardo, now we enter from the parvis (courtyard) on the side of the church. This entry was posted in Archaeology, Jerusalem on May 6, 2010 by Shmuel Browns.